Well – I have just the recipe for you to print and keep handy. We have used this several times already with fantastic results and we were very thankful for it might I add. Combine all the above ingredients at the same time. 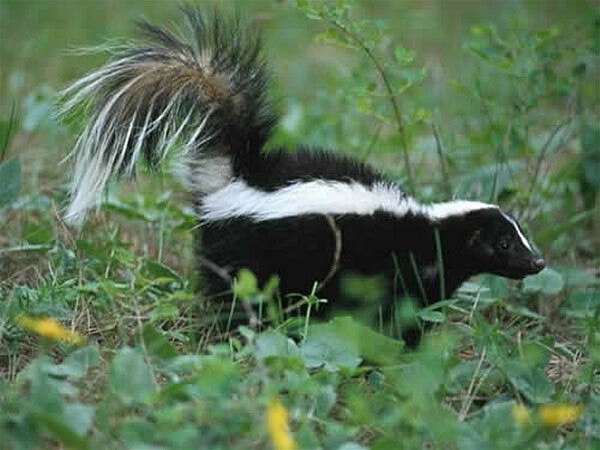 This solution removes the skunk odor because of the instant chemical reaction between the ingredients so this needs to made and used immediately. This can not be made ahead of time because it will become ineffective. Apply the mixture to the affected area and leave sit for 5 minutes before rinsing. Be sure to keep away from your animals eyes, nose and mouth. You will most likely need to reapply. Once we have gotten rid of the odor we have also applied shaving cream which adds a nicer sent to the animal and covers up any hit of skunk that may be remaining. Hopefully you will not need to use this recipe this season, but if you do you will be very happy with the results. Now this is a useful recipe to have! I’m going to have to add it to one of my binders, so that it is available when a skunk pays a visit. Thanks!